1. In a large bowl, beat brown sugar and butter with electric mixer on medium speed 1 to 2 minutes, scraping bowl occasionally, until light and fluffy. beat in vanilla and egg. On low speed, beat in flour, baking powder and salt until dough forms. In a small bowl, place 1 cup of the dough; stir in melted chocolate and baking soda until well blended. 2. On a 12 X 8-inch sheet of plastic wrap, press half of the light dough to form a 10 X 4-inch strip. Shape half the chocolate dough into a roll 10-inches long; place on strip of light dough. Mold sides of light dough around chocolate dough; wrap in plastic wrap. Repeat with remaining dough. Refrigerate 1 hour for easier handling. 3. Preheat oven to 350°F. 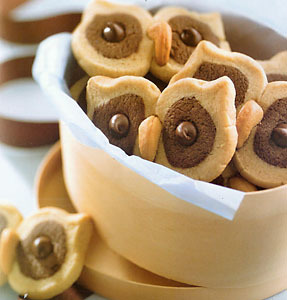 Cut each roll into 40 (1/8 to 1/4-inch) slices; place 2 slices, sides touching, on ungreased cookie sheets to resemble owl faces. Pinch corner of each slice to form ears. Place chocolate chip in center of each slice for eyes; press whole cashew between slices for beak. 4. Bake for 8 to 10 minutes or until edges are light golden brown. Immediately remove from cookie sheets. Decrease brown sugar to 3/4 cup; increase flour to 2 1/2 cups. 110 Calories (60 Calories from Fat); 7g Total Fat; 3.5g Saturated Fat; 0g Trans Fat; 15mg Cholesterol; 170mg Sodium; 12g Total Carbohydrate; 0g Dietary Fiber; 7g Sugars; 1g Protein. 2% Vitamin A; 0% Vitamin C; 2% Calcium; 4% Iron. 1/2 Starch; 1 1/2 Fat.